San Elizario sophomore Edwin Gomez had a great weekend at the Chandler Rotary Invitational in Arizona. Gomez earned city-best times in the 1,600 (4:18.75, good for 7th) and in the 3,200 (9:17.44), where he finished third overall. Here are the results from the Cotton Relays – runnercard.com/runner/data/35045/1002374/result/Results.htm. Here are the results from the Chandler Rotary Invitational in Arizona – az.milesplit.com/meets/310486/results/634143/formatted#.XJkRjRNKii5. Discus: 1, Johnny Cerros, Franklin 158 feet; 2, Misael Oriz, Socorro, 157-4; 3, Andrews Bristol, Franklin, 154-4; 4, David Moreno, Jefferson 152-10; 5, Zachary Cyrus Pomele, Pebble Hills, 150-4; 6, David Moreno, Coronado, 149-2; 7, Adam Vick, Franklin, 139-7; 8, Dominque Valera, Coronado, 139-5; 9, Tony Holguin, San Elizario, 139-4; 10, Jalen Henderson, Americas, 139-0. Pole vault: 1, Keith Rodriguez, Eastlake, 14-0; 2, Matthew Sanchez, Coronado, 13-8; 3, Daniel Larios, Coronado, 12-6; 4, Daniel Cardenas, Mt. View, 12-04; 5, Evan Perez, Hanks, 11-6; 5, Angel Escalera, Parkland, 11-6; 5, Armando Villa, Americas, 11-6; 5, Alan Garcia, Mt. View, 11-6; 9, Luis Holguin, Burges, 11-3; 10, Victor Saenz, Del Valle, 11-0; 10, Austin Lara, Del Valle, 11-0; 10, Sebastian Deras, Del Valle, 11-0; 10, Andrew Almanza, Mt. View, 11-0; 10, Peter Fogel, Chapin, 11-0. Long jump: 1, Daniel Rivera, Horizon, 21-4; 1, Deion Hankins, Parkland, 21-4; 3, Hector Nevarez, Mt. View, 21-3; 4, Karch Gardiner, Del Valle, 20-11; 5, Elijah Davis, Pebble Hills, 20-8; 5, Derek Saldivar, Americas, 20-8; 5, Takeem Thomas, Eastwood, 20-8; 5, Zacarias Velasquez, Americas, 20-8; 9, Tavorus Jones, Burges, 20-6; 10, Gilbert Rodriguez, Mt. View, 20-5.5. Triple jump: 1, Gabriel Stonewall, Franklin 46-3; 2, Takeem Thomas, Eastwood, 44-11; 3, Donta Hayes, Parkland, 43-1.50; 3, Julian Hinojos, Americas, 43-1.50; 5, Kamuel Sloan, Franklin, 43-1; 6, Daniel Rivera, Horizon, 43-1; 7, Alec Marenco, Burges, 41-11; 8, Alec Villa, Hanks, 41-6.50; 9, Marcos Duran, Mt. View, 41-4.25; 10, Gilbert Rodriguez, Mt. View, 41-2.75. 800 meters: 1, Liam Walsh, Coronado, 1:55.75; 2, Noah Yeager, Burges, 1:57.22; 3, Alan Alba, Coronado, 1:57.24; 4, Fernando Morales, Franklin, 1:57.44; 5, Sam Zambrano, 1:57.78; 6, Kevin Campbell, Americas, 1:58.38; 7, Jared Cortina, Socorro, 1:59.68; 8, Thomas Magee, Chapin, 1:59.61; 9, Edwin Gomez, San Elizario, 1:59.63; 10, Joshua Gonzalez, Mt. View, 1:59.64. 1,600 meters: 1, Edwin Gomez, San Elizario, 4:18.75; 2, Brandon Seagreaves, Cathedral, 4:18.98; 3, Sam Zambrano, Burges, 4:23.39; 4, Michael Abeyta, Hanks, 4:23.72; 5, Tyler Rodriguez, Americas, 4:24.99; 6, Liam Walsh, Coronado, 4:27.33; 7, Elias Perez, Eastwood, 4:27.75; 8, Rodger Rivera, Hanks, 4:29.32; 9, Nick Gonzalez, Coronado, 4:29.94; 10, Sergio Leon Cuartas, Eastwood, 4:29.98. 3,200 meters: 1, Edwin Gomez, San Elizario, 9:17.44; 2, Elias Perez, Eastwood, 9:22.36; 3, Sergio Leon Cuartas, Eastwood, 9:26.95; 4, Brandon Seagreaves, Cathedral, 9:32.02; 5, Kayn Quinones, Eastwood, 9:42.88; 6, Tyler Rodriguez, Americas, 9:44.31; 7, Israel David, Eastlake, 9:44.97; 8, Michael Abeyta, Hanks, 9:45.66; 9, Rodger Rivera, Hanks, 9:47.35; 10, Jacob Wedemeyer, Franklin, 9:49.05. 300 meter hurdles: 1, Infante Jones, Parkland, 40.32; 2, Vince Armendariz, Americas, 40.65; 3, Jacob Luna, Eastwood, 41.00; 4, Chris Martinez, Franklin, 41.02; 5, Alex Colmenero, Parkland, 41.18; 6, Dominic Britton, Chapin, 41.46; 7, Jonathan Plascencia, Jefferson, 41.63; 8, Gavin Hidalgo, Eastwood, 42.09; 9, Caleb Stewart, Americas, 42.19; 10, Angel Escalera, Parkland, 42.20. 400 meter relay: 1, Americas ‘A’ (Armando Villa, Abel Cervantes, Ryan Acosta, Julian Hinojos), 43.03; 2, Pebble Hills ‘A’ (Caleb Gerber, Jim Edward, Jalen Partida, James Hadnot), 43.36; 3, El Dorado ‘A’ (Duane Nelson, Ricky Espinoza, Alex Milian, Cedric Haynes), 43.76; 4, Eastwood, 44.06; 5, Ysleta (Joshua Lopez, Elias Medel, Giovanni Martinez, Damian Carrasco), 44.07; 6, Franklin ‘A’ (Darryn Clark, Angel Jurado, Isreal Hudson, Ethan Bustillos), 44.18; 7, Austin ‘A’ (Freddy Elizondo, Andrew Yco, Kevin Usera, Kameron Walker), 44.46; 8, Burges, 44.50; 9, Andress, 44.65; 10, Montwood ‘A’ (David Niebla, Carlos Cisneros, Carlos Flores, Evan Cisneros), 44.88. 800 meter relay: 1, Americas ‘A’ (Ryan Acosta, Abel Cervantes, Julian Hinojos, Armando Villa), 1:29.53; 2, Franklin ‘A’ (Darryn Clark, Angel Jurado, Ian Tharp, Omajuwa Etiwe), 1:30.32; 3, Pebble Hills ‘A’ (Isaiah Davis, Ian Edward, Sebastian Ochoa, Galeb Gerber), 1:31.14; 4, Austin ‘A’ (Moises Morales, Kameron Walker, Miguel Vazquez, Kevin Usera), 1:31.17; 5, Eastwood ‘A’ (Marcus Ransom, Xavier Avila, Osmar Ibarra, Eddie Cruz), 1:32.85; 6, Hanks, (Samuel Guitterez, Ivan Regalado, Joey Padilla, Julian Mendoza), 1:32.91; 7, Horizon, 1:33.19; 8, El Dorado (Duane Nelson, Ricky Espinoza, Xzavion Brooks, Cedric Haynes), 1:33.23; 9, Ysleta, (Jalen Promesse, Damian Carrasco, Lucas Flores, Giovanni Martinez,), 1:33.37; 10, Burges, 1:33.49. 1,600 meter relay: 1, Franklin ‘A’ (Ian Tharp, Ethan Bustillos, Fernando Morales, Omajuwa Etiwe), 3:21.37; 2, Americas ‘A’ (Ryan Acosta, Julian Hinojos, Sir Drennan, Abel Cervantes), 3:24.33; 3, Burges, 3:24.74; 4, Eastlake (Kevin Aravelo, Lorenz Smith, David Christobal, Michael Garcia), 3:29.14; 5, San Elizario ‘A’ (Alex Devora, Alexis Maldonado, Tony Diaz, Alexis Gurrola), 3:30.59; 6, Austin ‘A’ (Steven Montoya, Miguel Vazquez, Andrik Zamora, Ethan Villa), 3:30.89; 7, Parkland ‘A,’ 3:32.42; 8, Coronado ‘A’ (Nick Gonzalez, Josh Espino, Alan Alba, Liam Walsh), 3:32.92; 9, Hanks, 3:33.09; 10, Montwood ‘A’ (Brandon Williams, Kenneth Dominguez, Matthew Lindsey, Christian Rivera), 3:33.82. Saturday was a big day for a couple of El Paso area athletes on the fourth week of the track and field season. Cathedral senior and University of Houston commit Brandon Seagreaves continues his impressive season breaking a 45-year school record in the 1,600-meter run by improving on his city-best time by a full 18 seconds with a 4:18.98 mile against a jam-packed field at Canutillo. Franklin junior Omajuwa Etiwe ran a personal best of 48.18 in the 400 meters (fifth fastest in Texas) at Canutillo on Saturday. Pebble Hills senior Caleb Gerber who improved his high jump height by four feet, clearing the bar at 6-feet, 8 inches. Horizon’s Daniel Rivera tied Parkland’s long jump mark of 21-feet, 4-inches to share the city best ranking. 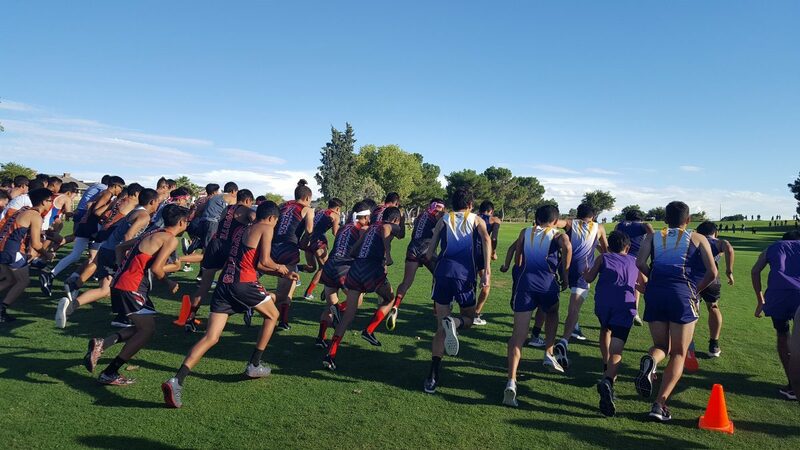 Here are the results from Hanks https://www.runnercard.com/runner/data/26222/1002346/result/Results1.htm; from Canutillo http://ehstrack.bravehost.com/trackmeet/index.htm and from Mt View www.runnercard.com/runner/data/19643/1002270/result/MTN%20VIEW%20TRACK%20INVITE%20–%20MARCH%202019.pdf. Discus: 1, Johnny Cerros, Franklin 158 feet; 2, Misael Oriz, Socorro, 157-4; 3, Andrews Bristol, Franklin, 154-4; 4, David Moreno, Jefferson 152-10; 5, Zachary Cyrus Pomele, Pebble Hills, 150-4; 6, David Moreno, Coronado, 141-9; 7, Adam Vick, Franklin, 139-7; 8, Tony Holguin, San Elizario, 139-4; 9, Jalen Henderson, Americas, 139-0; 10, Garrett Stokes, Burges, 134-11. Shot put: 1, Misael Ortiz, Socorro, 53-1.50; 2, Garrett Strokes, Burges, 52-8.5; 2, Jonathan Lopez, Montwood, 48-8; 3, Arturo Jimenez, Horizon, 48-4; 4, Johnny Cerros, Franklin 48-4; 5, Andrew Bristol, Franklin, 48-00.50; 6, Lean Smith Jr., Franklin, 46-8; 7, Nick Kim, Americas, 46-6.5; 8, Dominique Varela, Coronado, 46-6; 9, David Moreno, Jefferson, 46-4; 10, David Moreno, Coronado, 45-7.50. Pole vault: 1, Keith Rodriguez, Eastlake, 14-0; 2, Daniel Cardenas, Mt. View, 12-0; 3, Matthew Sanchez, Coronado, 11-6; 3, Armando Villa, Americas, 11-6; 3, Alan Garcia, Mt. View, 11-6; 3, Angel Escalera, Parkland, 11-6; 7, Victor Saenz, Del Valle, 11-0; 7, Daniel Larios, Coronado, 11-0; 7, Austin Lara, Del Valle, 11-0; 7, Sebastian Deras, Del Valle, 11-0; 7, Andrew Almanza, Mt. View, 11-0. Triple jump: 1, Gabriel Stonewall, Franklin 46-3; 2, Kamuel Sloan, Franklin, 43-1; 3, Julian Hinojos, Americas, 43-1.50; 4, Daniel Rivera, Horizon, 43-1; 5, Takeem Thomas, Eastwood, 42-8; 6, Donta Hayes, Parkland, 42-4.50; 7, Marcos Duran, Mt. View, 41-4.25; 8, Gilbert Rodriguez, Mt. View, 41-2.75; 9, Michael Haack, Franklin, 41-2.50; 10, Angel Escalera, Parkland, 40-9. 200 meters: 1, Isaiah Davis, Pebble Hills, 22.06; 2, Abel Cervantes, Americas, 22.16; 3, Kameron Walker, Austin, 22.18; 4, Ian Tharp, Franklin, 22.49; 5, Matthew Flowers, Canutillo, 22.75; 6, Julian Hinojos, Americas, 22.79; 7, Ryan Acosta, Americas, 22.86; 8, Julian Mendoza, Hanks, 22.89; 9, Irvin Lopez, Del Valle, 22.92; 9, Samuel Guitterez, Hanks, 22.92. 800 meters: 1, Liam Walsh, Coronado, 1:55.75; 2, Noah Yeager, Burges, 1:57.22; 3, Alan Alba, Coronado, 1:57.24; 4, Fernando Morales, Franklin, 1:57.44; 5, Thomas Magee, Chapin, 1:59.61; 6, Edwin Gomez, San Elizario, 1:59.63; 7, Matthew Lindsey, Montwood, 2:00.60; 8, Sam Zambrano, Burges, 2:01.15; 9, Michael Abeyta, Hanks, 2:01.78; 10, Joshua Gonzalez, Mt. View, 2:02.30. 1,600 meters: 1, Brandon Seagreaves, Cathedral, 4:18.98; 2, Michael Abeyta, Hanks, 4:23.72; 3, Tyler Rodriguez, Americas, 4:25.24; 4, Edwin Gomez, San Elizario, 4:25.63; 5, Liam Walsh, Coronado, 4:27.33; 6, Elias Perez, Eastwood, 4:27.75; 7, Rodger Rivera, Hanks, 4:29.59; 8, Nick Gonzalez, Coronado, 4:29.94; 9, Sergio Leon Cuartas, Eastwood, 4:29.98; 10, Alan Alba, Coronado, 4:32.04. 3,200 meters: 1, Brandon Seagreaves, Cathedral, 9:36.51; 2, Michael Abeyta, Hanks, 9:45.66; 3, Rodger Rivera, Hanks, 9:47.35; 4, Edwin Gomez, San Elizario, 9:46.30; 5, Nick Gonzalez, Coronado, 9:53.95; 6, Tyler Rodriguez, Americas, 9:57.55; 7, Juan Olmos, Eastwood, 10:00.34; 8, Israel David, Eastlake, 10:00.78; 9, Sergio Leon Cuartas, Eastwood, 10:02.15; 10, Christian Parra, Socorro, 10:03.91. 110 meter hurdles: 1, Infante Jones, Parkland, 15.11; 2, Dominic Britton, Chapin, 15.22; 3, Caleb Stewart, Americas, 15.40; 4, Jacob Luna, Eastwood, 15.52; 5, Alex Colmenero, Parkland, 15.63; 6, Joshua Massaquoi, Franklin, 15.68; 7, Chris Martinez, Franklin, 15.70; 8, Gavin Hidalgo, Eastwood, 15.73; 8, Donta Hayes, Parkland, 15.73; 10, Vince Armendariz, Americas, 15.85. 300 meter hurdles: 1, Infante Jones, Parkland, 40.32; 2, Vince Armendariz, Americas, 40.77; 3, Chris Martinez, Franklin, 41.02; 4, Alex Colmenero, Parkland, 41.18; 5, Caleb Stewart, Americas, 42.19; 6, Dominic Britton, Chapin, 41.46; 7, Angel Escalera, Parkland, 42.20; 8, Jonathan Plascencia, Jefferson, 42.36; 9, Gavin Hidalgo, Eastwood, 42.55; 10, Jesus Rodrgiuez, El Dorado, 42.76. 400 meter relay: 1, Americas ‘A’ (Armando Villa, Abel Cervantes, Ryan Acosta, Julian Hinojos), 43.03; 2, Pebble Hills ‘A’ (Caleb Gerber, Jim Edward, Jalen Partida, James Hadnot), 43.36; 3, El Dorado ‘A’ (Duane Nelson, Ricky Espinoza, Alex Milian, Cedric Haynes), 43.76; 4, Eastwood, 44.06; 5, Ysleta (Jalen Promesse, Elias Medel, Giovanni Martinez, Damian Carrasco), 44.13; 6, Franklin ‘A’ (Darryn Clark, Angel Jurado, Isreal Hudson, Ethan Bustillos), 44.18; 7, Austin ‘A’ (Freddy Elizondo, Andrew Yco, Kevin Usera, Kameron Walker), 44.461; 8, Burges, 44.83; 9, Montwood ‘A’ (David Niebla, Carlos Cisneros, Carlos Flores, Evan Cisneros), 44.88; 10, Horizon, 44.89. Cathedral senior and Houston commit Brandon Seagreaves continues his impressive season breaking a 45-year school record in the 1,600-meter run by improving on his city-best time by a full 18 seconds with a 4:18.98 mile against a jam-packed field at Canutillo.